“If the season ended today” has to be one of the most grating phrases the NFL talking heads utter on a seemingly non-stop basis in the month of December. Sure, the detailed Xs and Os of particular hypothetical matchups may be interesting to discuss a time or two, but fans quickly tire of the “what ifs” getting in the way of “games that are definitely happening that will impact the postseason.” I say this because a) I am a football fan and b) I don’t want you to think I’m putting an early and useless “If the season ended today” post in front of your face. What I am going to do, however, is take a look at the four NFC teams most likely to host one of the two NFC Wildcard playoff games this season and see where prices currently stand. These are, of course, all currently listed with the curious “If Necessary” tag on the ticket listing. While the two teams earning a first round bye can often be locked up with a few weeks remaining (paging Green Bay, WI), NFL Wildcard scenarios often take until week 17 to play out completely and determine the lower-ranking division champs who will host the first two conference post season games. Tickets of games that may happen are not a big gamble: if the game doesn’t happen and you’ve bought your seats on the up and up, you get your money back. 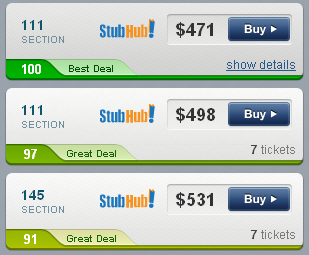 So let’s check out some NFC Wildcard playoff ticket prices. Remember (or learn, if you’re new to all of this) that each NFL division champ – four in each conference for a total of eight league-wide – is guaranteed to host one playoff game. Regardless of record, a division champ will always host a game against an NFL Wildcard team, regardless of their respective regular season records. If this sounds odd, consult with New Orleans fans who saw their team travel to Seattle last season despite the fact the Saints were 11-5 while the Seahawks were a sub-.500 7-9. And then Seattle won thanks to something called “Beast Mode.” Got it? Good. As we mentioned, the Packers won’t be on this list because they’ve all but secured a top-two seed with a bye at 11-0. They currently lead the teams tied for second in the NFC North by four games with five to play, and Green Bay also leads the second-best team in the conference, San Francisco, by two games. The 49ers are likely to be the other team with a bye. Although they only lead New Orleans Saints by a game in the standings, four of their final games are against other NFC West teams (combined record of 13-32 if you account for two games against last place St. Louis). 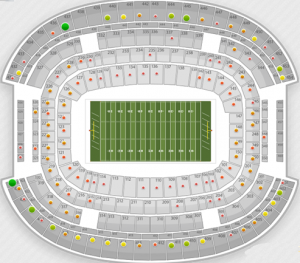 The cheapest NFC Wildcard game tickets in Atlanta are $157 (end zone corner, upper deck), while cheap Saints playoff tickets cost $273 and are also in the upper deck’s corner of the end zone. The Best Deal for Dallas Cowboy playoff tickets will currently run you less than $100 for a spot in the upper deck of the end zone (section 424) or $120 for an end zone corner in the upper deck (437). 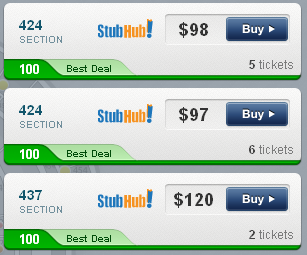 New York Giant ticket prices are dictating a higher dollar amount, albeit in better seats. The Best Deal for a Giants playoff game is currently $288 for an upperdeck seat on the home sideline’s 20 yard line. The cheapest Giant playoff ticket prices aren’t much less: end zone sections 307 and 349 currently have seats for $252; there are many listings for Cowboys playoff tickets for just under $100 in 424. So there’s your first look at NFC Wildcard Ticket Prices for the NFL Playoff Games. If you have questions about getting you NFC Wildcard tickets or NFL Playoff ticket prices in general, contact us on Twitter @SeatGeek or write chad@seatgeek.com.